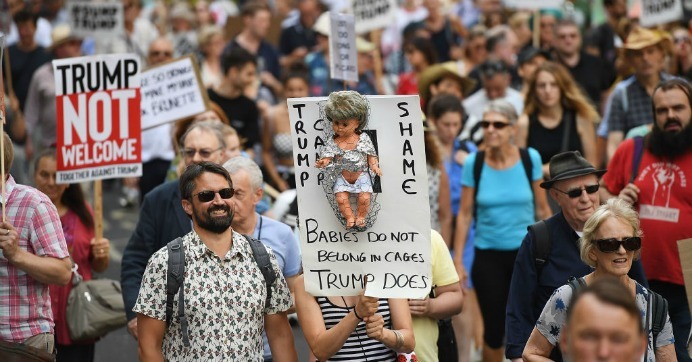 London protest against Donald Trump on July 13. 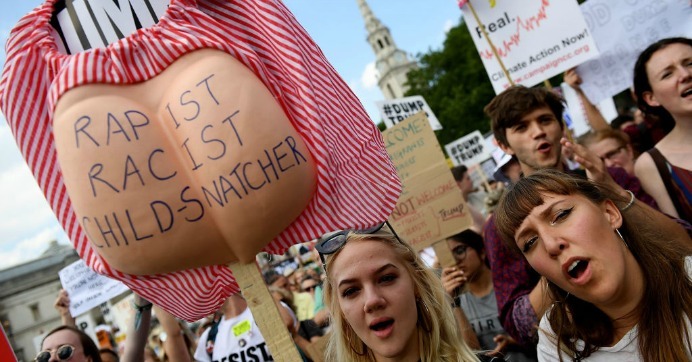 After Donald Trump was greeted with angry protesters as he arrived in London on July 12 to meet with British Prime Minister Theresa May, a 20-foot-tall Trump baby blimp took flight over the city early on Friday, July 13 as the massive "Carnival of Resistance" protests — which are slated to last through the weekend — kicked off. 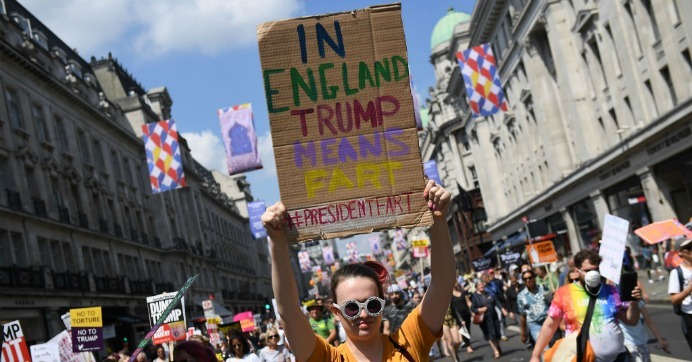 While May and Trump held hands then delivered a press conference at Chequers, tens of thousands of demonstrators poured into the streets for the main event—a 2pm march to Trafalgar Square in Central London, where anti-Trump Britons plan to host a rally Friday evening, despite accusations that British officials aimed to curtail protests. 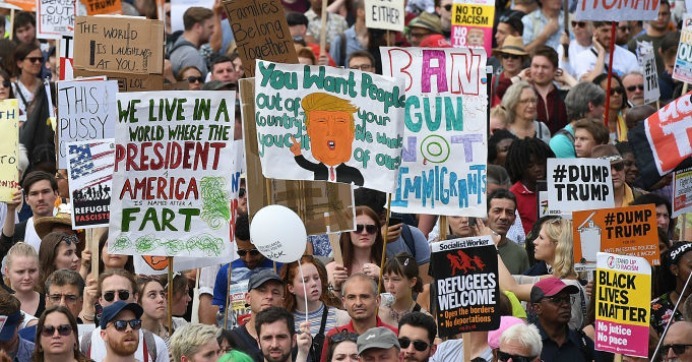 Participants shared updates on social media with the hashtags #TrumpUKVisit, #StopTrump, #TogetherAgainstTrump, and #CarnivalofResistance. Several of the events have been organised by the Stop Trump Coalition, which played a key role in Trump's previous cancelled trips and warns that "Trumpism directly threatens steps towards tackling" several issues including inequality, peace and disarmament, climate change, fighting discrimination — "particularly against already marginalised groups like migrants and Muslims" — and corporate greed. The Trump administration's family separation policy has further fueled widespread outrage and opposition to his visit. 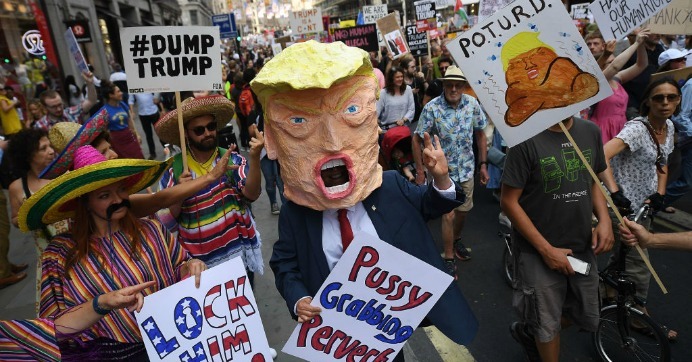 In a column for the Guardian on July 12, Owen Jones, who is part of the coalition, noted that "some of the establishment opposition has focused on Trump's vulgarity, his manners, that he is somehow unpresidential, rather than his political substance and what he represents," and emphasised the importance of protesting against Trump's actions and policies. "Yes, Trump is a contemptible misogynist, an anti-Muslim bigot, a scapegoater of migrants, a man whose administration separates screaming children from their parents and locks them in cages," he wrote. 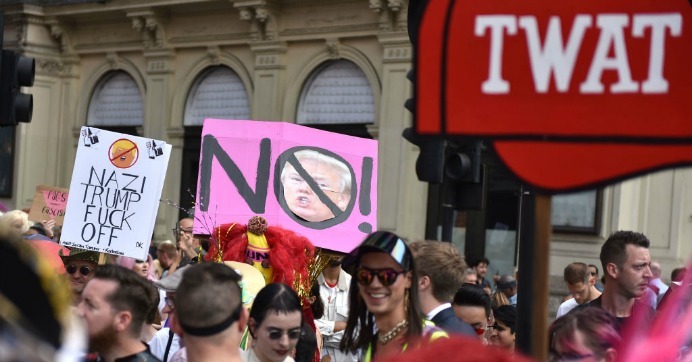 "Yet the protests against him must not see him simply as a pantomime villain, but as the chief representative of an extremely dangerous global movement." Earlier in the day, the Women's March London held a #BringTheNoise March followed by a 2pm rally in Parliament Square. "His presidency has been characterized by the spreading of fear, hate, and conflict worldwide," the group's website declares. "These are not our values." 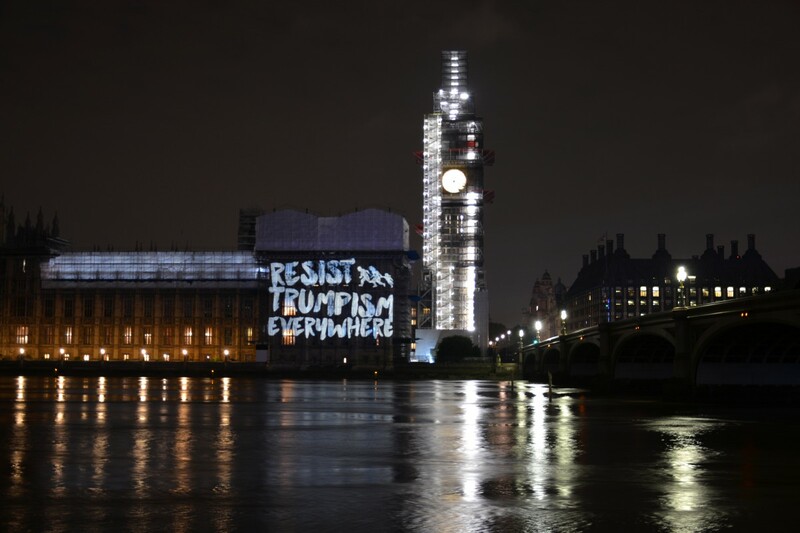 The demonstrations followed protests the day before, including the global consumer group SumOfUs projecting the message "resist Trumpism everywhere" onto the Palace of Westminster, London's iconic Marble Arch, and Cable Street in the East End. "As he begins his visit to the U.K., SumOfUs members want to express their solidarity with people in the United States who suffer at the hands of President Trump. But our message is also for people around the world, wherever they are," said senior campaigner Sondhya Gupta. "The U.S. president's policies are part of a growing, international tide of hatred, bigotry, and corporate greed that must stop." Reposted from Common Dreams. See more images of protester placards below also reposted from Common Dreams. Credit for the following photos goes to Chris Ratcliffe of Getty Images.